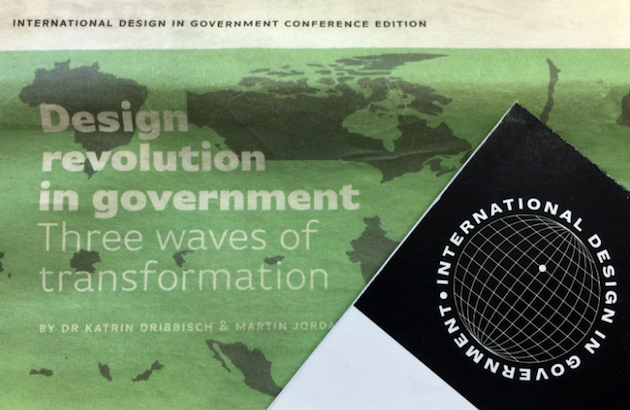 A round-up of day one at the International Design in Government Conference, by Matt Weeks. This July I attended the first ever International Design in Government Conference. Mary Ward House in London provided the perfect setting over two jam-packed days. 240 participants from 26 countries representing 96 different organisations got together. The aim was to “Bring together government designers from around the world who work across design, user research, accessibility and content design”. Lou kicked things off with a brilliant example of why it’s important for governments to work together. When a parcel arrives in the UK, it can be interrupted up to 14 times because we don’t know what’s in it. Lou believes that bad service design is one of the biggest unnecessary costs to the UK taxpayer. There are 950 designers now working in the UK government. This is a marked improvement on previous years but there is still some way to go. Lou tells us “Technology tells us what we can do. Design tells us what we should do. The future of government isn’t better technology, it’s better design”. Lauri was next up. He showed us how Estonia have made 99% of government services accessible online. An amazing achievement. This saves citizens five working days per year on average. They have paperless medical prescriptions, digital signing, online voting and submitting a digital tax return takes only three minutes. Asking for information once and reusing photographs saves time and money for citizens. Hefen gave us an insight into a new service. The Moments of Life app aims to make it easier to start a family. The app involved collaboration with 15 government departments – no easy feat. Hefen explained “We use an understand–design–test approach. All senior civil servants get hands-on training in design thinking, data analytics and behavioural insights”. Chris closed the first day with an honest talk. He’s bringing Canada’s service up to standard by begging, borrowing and stealing people and patterns from global governments all over the globe. This was apt and reminded us how lucky we are to have an open and collaborative design community in government. Writing about statistics: why is shorter, better?